wife of poet George Gordon Byron (1792-1860). 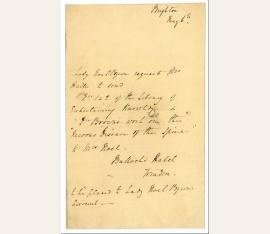 Autograph letter signed ("A. I. Noel Byron"). Moore Place, Esher. 8vo. 2½ pp. on bifolium. Includes an engraved portrait of Lord Byron with a print of his poem, "Fare thee well". To an unidentified Lord, contributing 10 pounds towards the erection of a new chapel: "In compliance with the wish you have expressed to me in so kind a manner, I will settle an endowment of Ten Pounds on the Minister of Petton. I should have great satisfaction in doubling that sum, if the New Chapel were open to the use of Christians of a different denomination, as is the case with Protestant Churches abroad - but as long as the present exclusion system is continued I shall feel that Roman Catholics & Dissenters have likewise a claim to the Landowner's assistance. Your Lordship will I trust pardon me for giving this explanation in order to account for the smallness of my contribution. 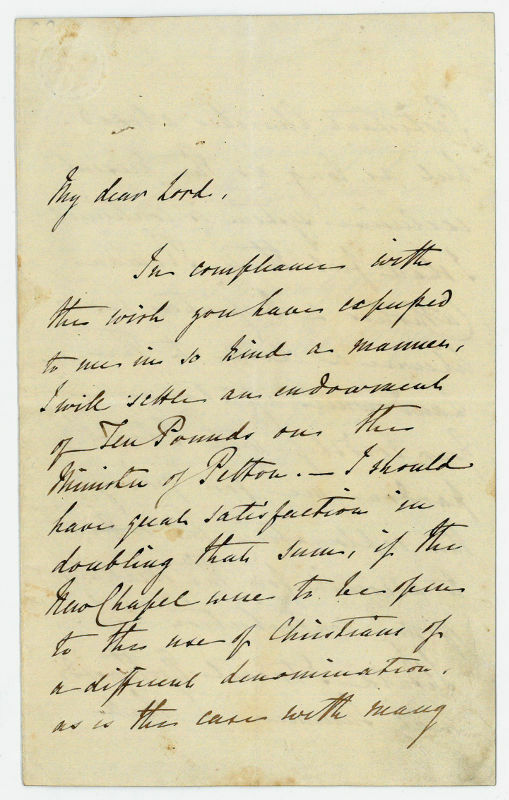 Should I travel Northwards next Summer, I shall be happy to accept yours & Mr Maltby's gratifying invitation [...]". - A highly educated and strictly religious woman, Anna Isabella seemed an unlikely match for the amoral and agnostic poet Byron. Indeed, the marriage lasted but a year, as Byron was given to fits of anger and maintained an incestuous relationship with his older half-sister Augusta Leigh. The couple separated in March 1816. Their only child, Augusta Ada Byron (Countess of Lovelace), was a gifted mathematician and is credited with creating the first computer program..
wife of poet George Gordon Byron (1792-1860). Autograph book order signed. Brighton. 1 p. on bifolium. 8vo. 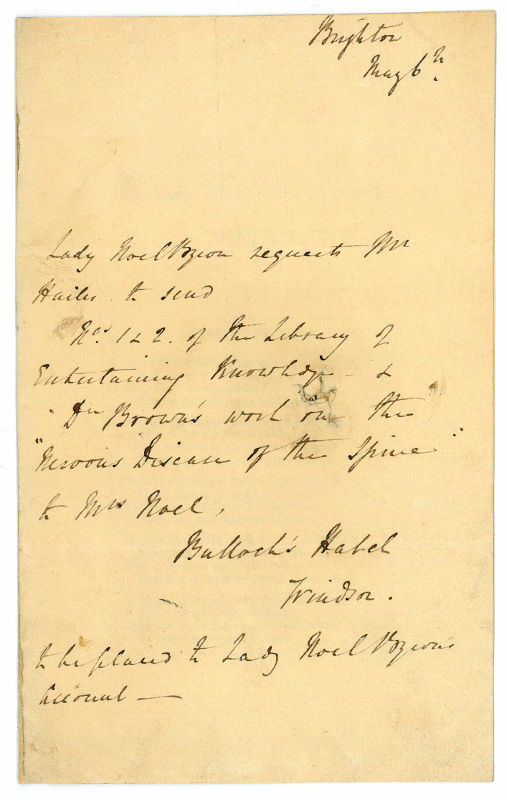 "Lady Noel Byron requests Mr Hailes to send Nos. 1 & 2 of the Library of Entertaining Knowledge & Dr Brown's work on the 'Nervous Disease of the Spine" to Mrs Noel, Bullock's Hotel, Windsor, to be placed to Lady Noel Byron's account." With Byron's poem "Fare thee well!" (in letterpress) pasted to the second leaf; traces of mounting on reverse. - A highly educated and strictly religious woman, Anna Isabella seemed an unlikely match for the amoral and agnostic poet Byron. Indeed, the marriage lasted but a year, as Byron was given to fits of anger and maintained an incestuous relationship with his older half-sister Augusta Leigh. 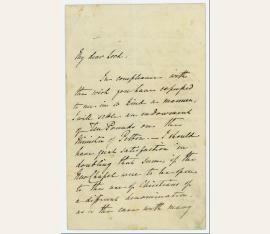 The couple separated in March 1816. Their only child, Augusta Ada Byron (Countess of Lovelace), was a gifted mathematician and is credited with creating the first computer program..